Holland America Flower Gardens converted its massive west greenhouse into a shopping experience available to the entire family. During tulip season we welcome you to shop our industrial floral cooler for fresh cut, certified American grown, flowers. 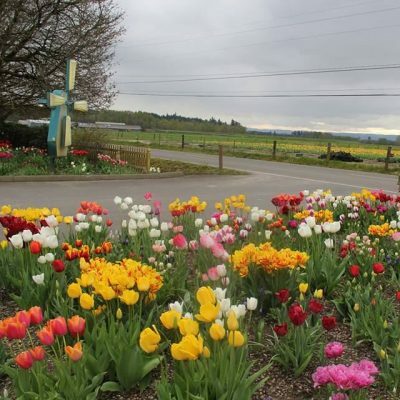 Bring in your tulips from our U-Pick field and we can help you make custom bouquets to take home in wraps or vases. The gift shop carries gifts for your loved ones, home, and garden. We are always looking for new and unique items. Be sure to check in for our new featured keepsakes and imports from Holland. Check back or visit or facebook page to get frequent updates. The show fields and u-pick fields will be open to the public this weekend. The gift shop will begin additional weekend hours through Mother’s Day. It’s finally tulip time, Our favorite time of year. Check our facebook to see field status photos and plan your perfect trip. We will have a bouquet station this year to wrap your tulips and any additional fresh flowers you select into a gorgeous mix. All the beautiful spring flowers are such a great symbol of growth and rebirth.